The next iteration of Witchblade has arrived and Top Cow has assembled another great creative team to bring the legendary wielder of the powerful artifact to life. Handed down from one worthy woman warrior to another for ions, the Witchblade gauntlet has chosen its next host in wartime journalist Alex Underwood. She suffers from PTSD and helps battered women find justice. The book opens with her bloodied and dying. The non-linear story jumps around from what led up to her situation, to helping an abused cop's wife, to having visions probably induced by the gauntlet. She rejects the growing power of the Witchblade it but that could kill her. The trouble with origin stories like this is the predictability of passing the torch to another chosen one. 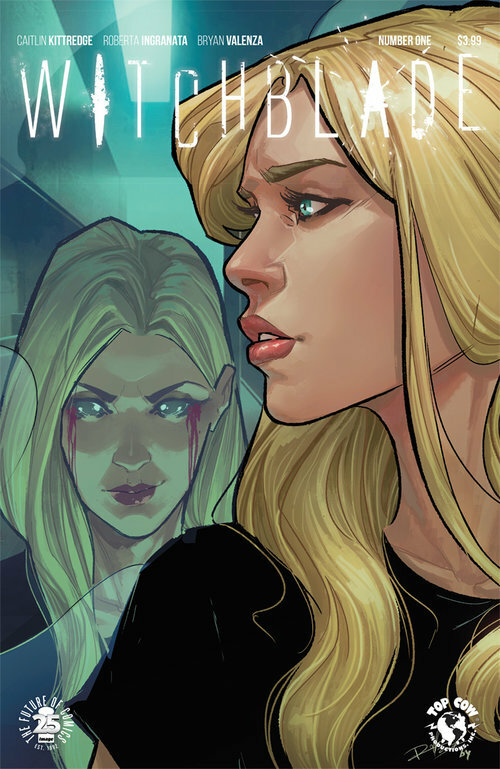 We know that Alex will eventually take to the Witchblade and use it for good but we have to endure the rigamarole of first accepting the responsibility. It's the price of admission in the great tradition of Top Cow's iconic franchise. Things will get better and more exciting as Alex takes on the role of Witchblade and begins to administer justice. She'll have to because there are forces looking to stop her before she's fully transformed. Caitlin Kittredge is laying the foundation as required and if the cliffhanger is any indication the next issue is going to be wild. The art is absolutely gorgeous. Roberta Ingranata's pencils are super clean and details so realistic with amazing layouts. Ingranata creates an energy in the staidest of situations with varied angles and perspectives. Bryan Valenza's colors are perfectly matched with mostly pastels but a running theme of red and gradients of red are throughout tying the whole book together. There are dark moments and they could have easily been washed out in black and grays but Valenza softens those scenes with a tinge of blue. It's easily one of the best-looking books on the market. 'Witchblade' is a legacy title that has historically delivered great characters and thrilling action. Its mythos goes back over twenty years. The universe is rich with different factions fighting for control. In this latest chapter of the Witchblade saga is off to a familiar but explosive start. It should appeal to longtime fans and new ones if given the chance over the course of the first arc.